Clarinda was just 15 when a youth worker walked into the YMCA and shot her. Nothing personal, it was just his initiation into a gang. He had to show he was unafraid to use a gun or to go to jail. Clarinda says this boy “still harasses my life today.” But it’s paid off, inspiring her to follow him to college. Although family, friends, and rehab specialists all had a role, Clarinda’s life accomplishments show these helpers were starting with one tough cookie. The girl whose grades were horrible, who didn’t want to finish high school, achieved a master’s degree. This led her to a career recruiting underprivileged students to medical school, and then placing them as professionals in areas with limited access to health care to repay their educational debt. 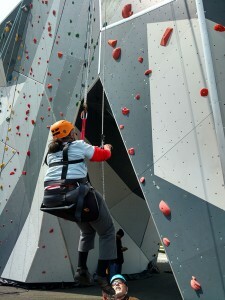 By the way, care to guess who was one of the first to climb the newly opened climbing wall in Chicago’s Maggie Daley Park?